Today Flash memory is everywhere in Pen drives, Digital camera, MP3 players and in almost all portable electronic devices. Flash memory is a Non volatile Erasable memory device that can be reprogrammed. Dr.Fujio Masuoka of Toshiba introduced the Flash memory in 1984 to the world. Flash memory uses a special type of Electrically Erasable Programmable Read Only Memory (EEPROM) technology to erase and reprogamme the datas. Since flash memory is non-volatile, no power is needed to maintain the information stored in the chip. Flash memory uses the EEPROM Chip to store datas. This chip has a lattice of columns called Bit lines and rows called word lines. Each point of intersection is considered as a Cell. Billions of such intersecting points are present in the chip. The Cells in the chip are made of MOSFET (Metal Oxide Semiconductor Field Effect Transistor).The MOSFETs used in flash memory chip are special kind with a Floating Gate (Floating Gate Metal Oxide Semiconductor FET- FGMOSFET). The FGMOSFET has two gates called Control Gate and Floating gate instead of the one in ordinary MOSFET. The Floating gate is coated with an insulating Oxide layer made up of Silicon Oxide. The Floating gate is interposed between the Control gate and the MOSFET channel. Since the Floating gate is insulated, the electrons trapped in it remain as such for many years. When the Floating gate traps electrons, it partially cancels the electric field from the Control gate. This modifies the Threshold voltage of the cell. Depending on this threshold voltage, the MOSFET channel conducts or remains non conducting during data read out process. During the read out, an intermediate voltage is applied to the Control gate to trigger the MOSFET channel. The current thus flowing in the MOSFET channel is sensed to create a Binary code. This reproduces the data. When a positive potential is applied to the control gate, the negatively charged electrons pushes through the insulated layer between the p-type substrates. Some of these electrons passes into the floating gate and get trapped in the insulating layer. The movement of electrons into the floating gate occurs through two mechanisms like Fowler – Nordhein Tunneling or Hot carrier Injection mechanism. In Fowler – Nordhein Tunneling mechanism, the electrons emitted from the semiconductor move into a dielectric due to strong electric field. In Hot carrier injection, the electrons or holes get kinetic energy to pass through the barrier. In Boolean logic operation, NAND means that if any one input is false, the conclusion is true. The binary coding used in computers are 0s and 1s. So if any one input is 0, then the output is 1.In NAND flash memory, the cells are arranged in series like a NAND gate used in ICs. This helps to erase and write datas very fast with less space. NAND flash memory technology was introduced by Toshiba in 1989.The NAND memory has blocks having many pages. Each page has 512 or 2.048 or 4,096 bytes size. Also these pages have Error correcting codes (ECC) having a size of 1/32 of the data size. Typical block size of the NAND memory includes 32 pages block size of 16 KB, 64 pages of block size 128 KB, 64 pages of block size 256 KB, and 128 pages block size 512 KB. In Boolean logic, NOR means, if any of the input is 1, the output is 0.In NOR flash memory, the cells are connected to ground in parallel to the bit lines .This helps to address each byte individually. But NOR gate writing and erasing is slower but the readout is very fast. Typical block sizes are 64, 128, or 256 KB. Erasing in NOR flash memory is the resetting of all the codes to 1s. For this a large potential is applied between the control gate and source of the MOSFET. The electrons are then pulled from the floating gate. All the cells in a block are erased together. 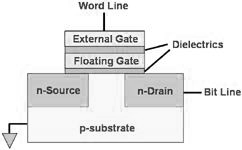 Programming of NOR cells, however, can generally be performed one byte or word at a time. In the erased state, all the cells are in 1 state. The setting of a cell to 0 state is done in programming. During programming, a higher voltage around 7 volts is applied to the drain (Bit line) and around 12 volts to the Source (Word line) of MOSFET. Electrons then move from source to drain. Some over excited electrons then jump into the floating gate through Hot carrier injection mechanism. These electrons get trapped in the insulated gate giving a negative charge to the floating gate. When the power is off, these electrons remain inside the insulated layer. Thus each call block can be programmed into millions of zeros and ones at very high speed. When a potential difference is applied between the control gate and drain of MOSFET, current begins to flow between the two. This voltage is not sufficient to remove electrons into the floating gate but detects the insulation or conduction of the floating gate. The cells then sense the current flow and identifies whether the cell is conducting or not. The conduction is then identified as 1 and insulation as 0. To increase the capacity of the flash memory, multiple chips are often arrayed in devices like Multimedia players and GPS systems. Common flash drives have a size 2 GB to 8 GB or more.